As a follow up to last week's post on offensive and defensive pace, here is a deeper dive into the offensive side of things. In that original post, I found that the Golden State Warriors have the league's third slowest pace on defense, despite leading the NBA in overall pace. The Warriors manage this by being really, really, really, ridiculously fast on offense, averaging nearly a second less per possession than the next fastest offensive team, the Celtics. When charted, their outlier status is clear. Offensive and defensive pace were calculated by analyzing the detailed play by play data for each game (the same data that powers my win probability graphs and box scores). Using that same data set, we can go even further, classifying possesions by how they begin. 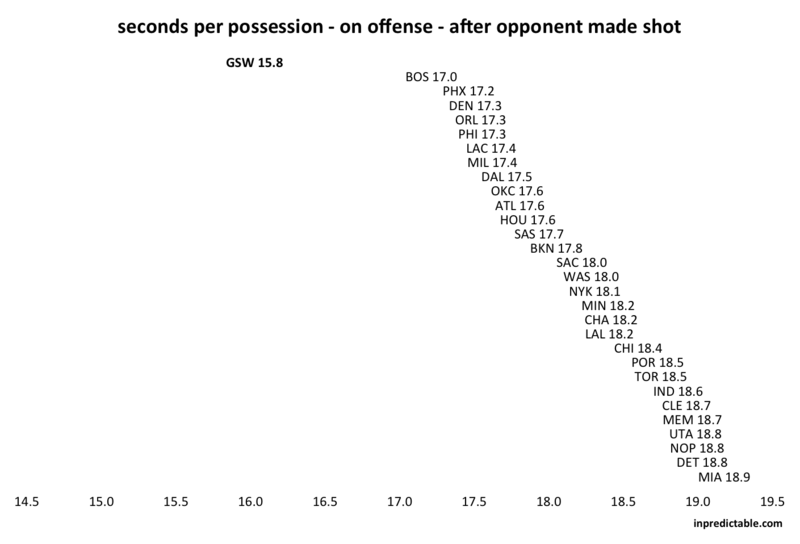 Possessions after opponent made shots tend to be the slowest and least efficient. The process of inbounding the ball usually allows enough time for the defense to get into position, preventing fast break opportunities and forcing the offense into a standard half court set. 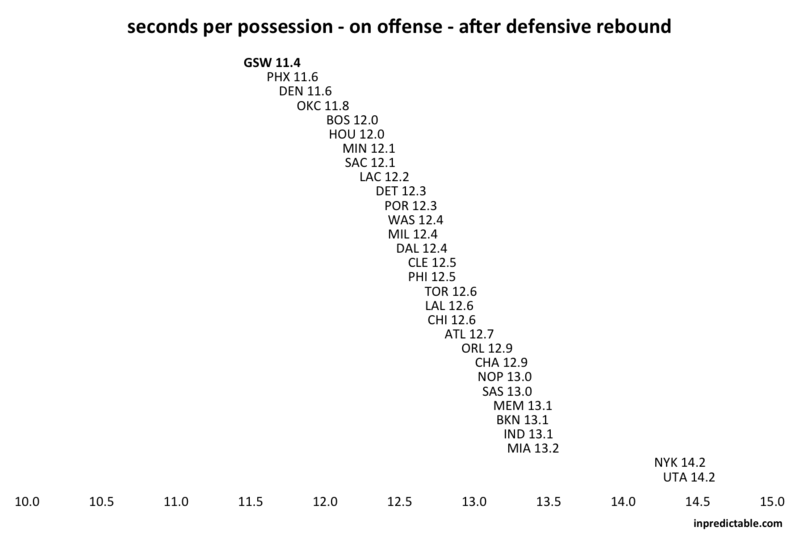 Defensive rebounds and turnovers lead to quicker possessions (e.g. fast breaks, transition baskets), and they also tend to be more efficient. But between the two, possessions off of turnovers are significantly more lucrative than those off of rebounds. And here are how those numbers split out by team (the table is sorted by overall offensive pace - fastest to slowest). The Cleveland Cavaliers lead the league in efficiency off of turnovers and defensive rebounds, but are just #10 after an opponent made shot. The Brooklyn Nets are dead last in efficiency off of turnovers. This looks particularly bad for Brooklyn as they are not a particularly bad team offensively. While nearly every team, even the lowly Sixers, manages higher offensive efficiency off of turnovers, the Nets average the same points per possession off of turnovers as they do off of opponent made shots - indications that Brooklyn may not be taking advantage of the scoring opportunities a turnover provides. 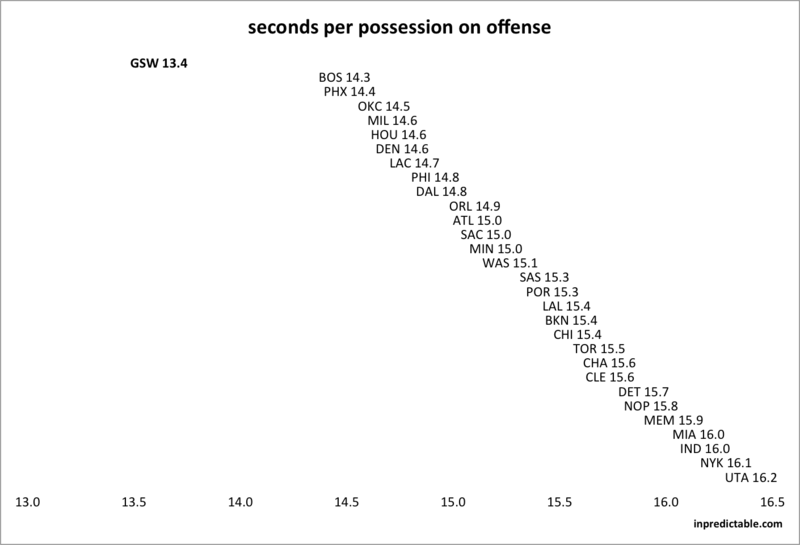 There is a 1.2 second gap in average possession time after made shots between the #1 Warriors and the #2 Celtics. In contrast, a 1.2 second gap separates the #2 Celtics and the 18th ranked Timberwolves. It's as if the Warriors are playing a different game than the rest of the league. The charts below take a closer look at the Warriors' pace and efficiency. The first chart compares distribution of possessions by possession length. The second chart looks at efficiency (points per possession) as a function of possession length. 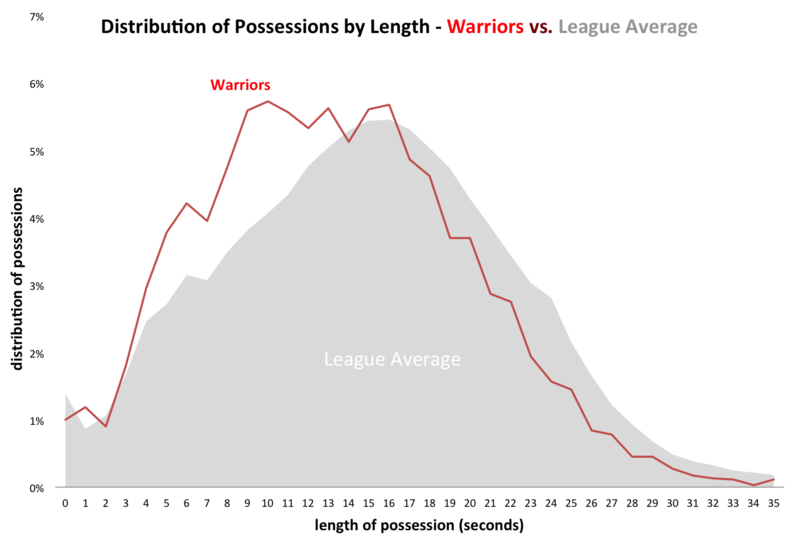 While the distribution of possessions peaks at around 16 seconds for the league, the Warriors peak much sooner around 10 seconds (and roughly plateaus for the next six). Looking at efficiency in the second chart, we see some interesting results at the league level. 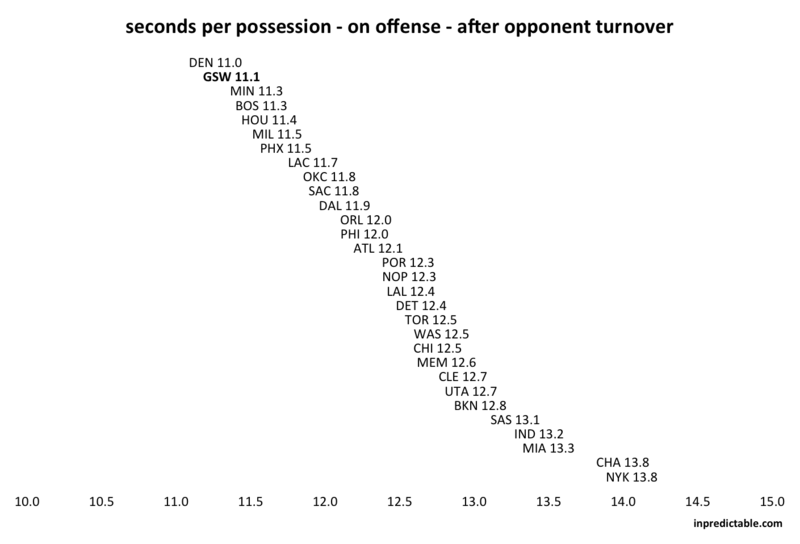 Possessions lasting only a few seconds are very inefficient and likely dominated by quick turnovers. We see peak efficiency around the "fast break zone" of 4 to 6 seconds, and then a sharp dropoff. Efficiency declines slowly between 7 and 21 seconds, and then accelerates after that as teams start running out of shot clock. Note that offensive rebounds can extend a possession indefinitely beyond the standard 24 seconds. The Warriors' efficiency curve generally follows the shape of the overall league, with somewhat better efficiency in that fast break zone. 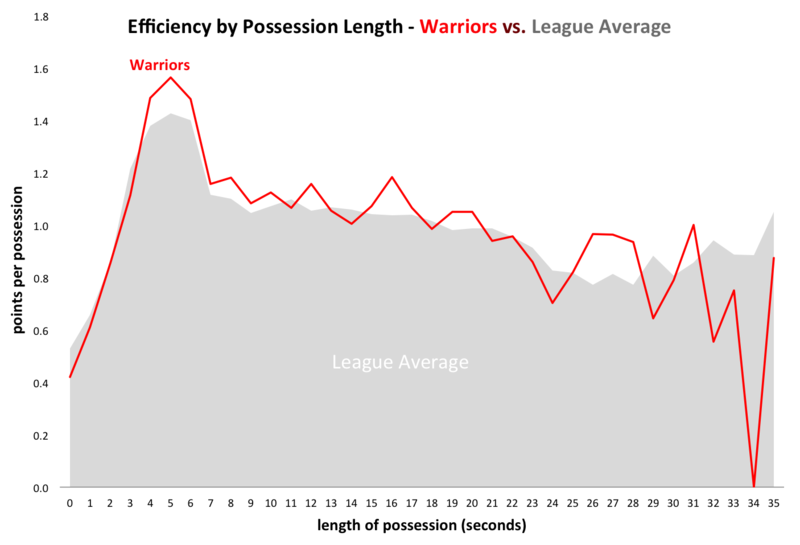 But part of the Warriors' offensive efficiency stems from simply avoiding that 20+ seconds low efficiency zone. However, it is difficult to say whether the Warriors' fast pace is the cause of their offensive efficiency, or merely a product of it.